I'm not sure if this is a universal problem but on my setup closing any individual workbook in Office 2016 takes a small eternity when working with larger workbooks (also for non-Modano workbooks). 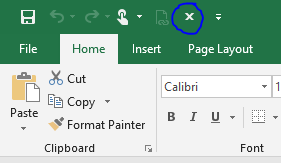 I was very happy to discover that I could get around this by adding the "Exit" command to my quick access toolbar, which works like the cross used to do on older versions of Office i.e. exiting Excel rather than closing the workbook you're in. Last week I started having problems with a Modano file when 'activating content' upon opening in that the Excel force closed. Luckily I've been saving the file down with a different name every 30 minutes for the past 2 years so I could just go back a couple of hours to restore my model but I'm curious whether my workaround could have caused this (maybe interrupted the Modano close workbook sequence or something similar)? The issues you're experiencing are a result of the single document interface (SDI) that Microsoft introduced in Excel 2013, which means every workbook now has its own window. This compares to the previous multiple document interface (MDI), which Excel used in Excel 2010 and earlier, which opened all workbooks as child windows of the single applicaton window. The issue with the SDI is that the last workbook to be closed forces a closing of Excel, which was not the case in MDI versions of Excel. This application exit process is clunky, and leaves quite a few things in a strange state, so add-ins which process workbook close events (including Modano) often take some time to unload, which is where you are seeing the lag. We ave re-coded the Modano close mechanism in the next major upgrade to address this issue, so hopefully after we release this you won't see any further lagging or crashing. These things are always a moving target with Microsoft. Please keep us posted if your issues persist after you install the next major upgrade.